Tarmac Sportz is very proud to have a partnership with NRG because it's clear that they share our passion for cars and tuning. No company puts the 'enthusiast' in enthusiastic more than NRG Innovations. This Californian car parts manufacturer prides itself on having been founded by genuine car lovers. They fully engage with all aspects of car tuning, from constantly developing new and better parts, to attending car shows and even holding their very own Annual Drift Matsuri Event. Rigorous testing of parts has resulted in excellent build quality, continuous innovation (hence the name) and the absolute best in ergonomics and safety. We would never sell you parts that we wouldn’t put in our own cars. We know that drivers love to make a car their own, and this also extends to how your interior looks. Our pals at NRG are committed to giving drivers the best in customisation options. 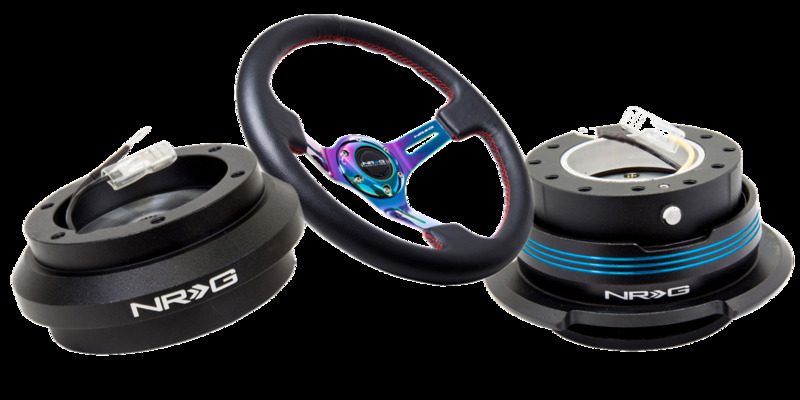 Whether you’re looking for a subtle, understated steering wheel to sit neatly in your carefully styled interior, or a bright neon statement to go with your souped-up street racer, NRG has what you’re after. What NRG excel in is variety. They even offer vintage wooden finished wheels to complete your classic car look - it’s not all neo-chromes and block colours. Leather lined wheels offer style, comfort and greater control, and deep dish (no, not the pizza) wheels offer an interesting and unique look for your interior. 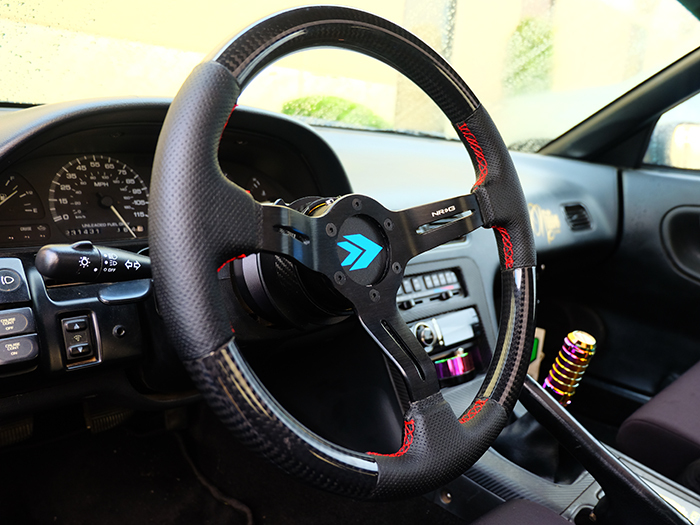 A huge variety of different colored steering wheel quick releases and even some glow in the dark accessories means that you can customise your interior to make it perfect for you. Quick-release steering wheels not only look cool, but are genuinely useful for getting in and out of your car with ease and are an excellent way of keeping your car safe from thieves. Just take your steering wheel off when you leave your car - what’s a thief going to be able to do with a car they can’t steer? We stock NRG’s fantastic range of quick-release units, all constructed from the highest quality aircraft or powder-coated stainless steel, so they’ll withstand the stresses and strains and any theft attempts. A patented ball and lock mechanism boats superior durability and usability, and facilitates clever options, like a raised section to prevent the hub from stretching. As well as that, NRG’s self-locking mechanism maximises the driver’s safety. A range of quick-lock systems, in a variety of colours, will add an extra layer of security to your steering wheel. A key system means that a thief won’t even be able to stick their own steering wheel in your hub and drive off. Keep hold of your key and your wheel, and your car won’t go anywhere without you in it. NRG also complement their quick-release units with a range of high-quality short hubs, which mean that the wheel won’t be too close to the driver. They’re designed using one-piece solid construction to make them as tough and durable as possible.